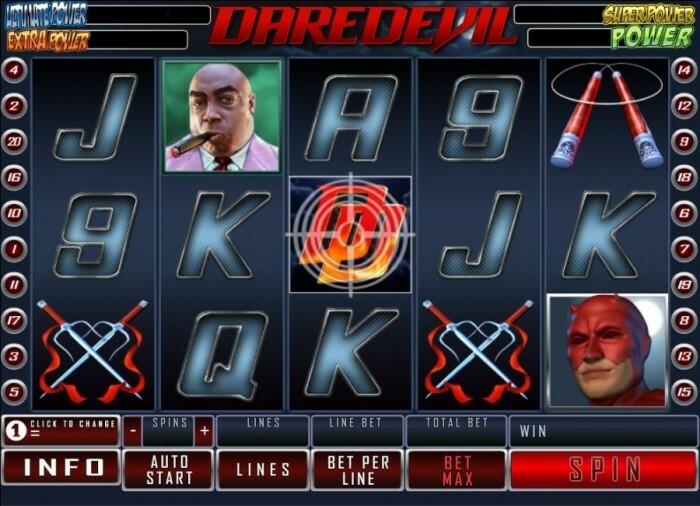 Daredevil slots is based off the Daredevil super hero from Marvel and Playtech. The theme as well as the symbols center on the theme. The game features a wild symbol and scatter symbol. Animation can be found in this particular game only the Daredevil symbol is animated. The other animation includes Elektra getting ready to attack and Kingpin moving from a portrait of figures and backgrounds. When two scatter symbols appear, the Daredevil logos animation is activated. When three or more appear, the Logo will transform. The audio is good but not exceptional and is appropriate for the game. The game uses high value cards as symbols, which can detract from the appeal of the game; additionally the fixed jackpot payouts are low in comparison to similar games. However, the game does have some redeeming factors such as an Interactive Bullseye, free game, and progressive jackpot. The game consists of the basic five reels, which seems to be an industry standard when it comes to video slots. However, the pay lines only total 20, which makes this a lower stakes game. The coin value size ranges from 0.01 to 5.00, which is a redeeming feature allowing players to wager up to 200 coins on a single spin however, there are only eight available values between 0.01 and 5.00 that the players can choose. The game includes an Auto play feature and the game speed can be adjusted. There are several available bonus options for this game. The first is the Bullseye feature. This is unique and fitting for the theme. When the bullseye is activated, the player is allowed to pick a spot in one of fifteen different reel potions. The player then clicks on that spot. When the player spins if the Bullseye symbol appears in the target spot, the player wins three times their bet. The Free games feature is triggered when a player obtains three or more scatter symbols in a given spin. When the free games feature is active, the player receives 10 free spins. After every spin, the radar sense will scan the reel and then turn between 0-3 symbols into wilds except for scatter symbols. Scatter wins are paid before symbols are added and line wins are paid out after. This can be retriggered as many times as possible. The Marvel Mystery Jackpot is a progressive jackpot consisting of four levels. The Daredevil symbol is also linked to this jackpot. It can be triggered randomly and appear after any spin. In this game however, the larger the ager the greater the chance of an appearance. When a jackpot round is triggered, one of the two available jackpots is guaranteed. The game decides which of the jackpots the player will win. The game consists of twenty squares. The symbols of one of the jackpot levels is hidden under each square. The players click on squares until three identical symbols are revealed, whichever jackpot is attached to those symbols is the one the player wins. Overall, the game has some interesting bonuses and options. The animation is decent as expected. However, the audio is not as great as one would expect. The jackpots are low in value though there is a progressive bonus, which may make up for the difference and the game does have a unique bullseye bonus that adds to its appeal.